The stone base of the old Lepton Cross stands to the east of the main church doors (see the photo to the right). 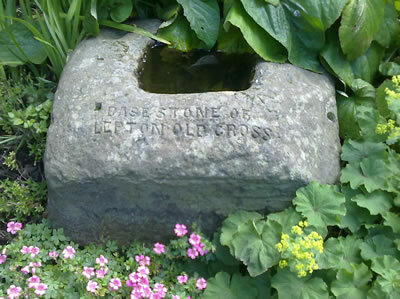 It formerly stood at the junction of Rowley Lane and Green Balk Lane, marking the place where the Christian faith was first preached in Lepton. This was followed by the Christians of Lepton getting together for services which were held in the upper room of a cottage at Town Bottom. It was hoped that one day a church would be provided for the people of Lepton as at this time people had to travel to Kirkheaton for weddings, christenings and funerals. On October 29th 1866 the cornerstone of the present building was laid. On Saturday 28th November 1868 the church was consecrated by the Lord Bishop of Ripon. 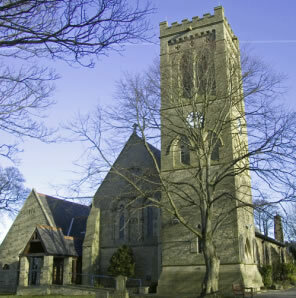 Lepton was at that time in the diocese of Ripon, Wakefield Diocese not being formed until 1888. The tower was added in 1876. A new top was added in 1929 when the old spire was deemed unsafe. A clock was placed in the tower in 1920 as a memorial to the men of Lepton who gave their lives in the 1st World War. In 1962 a Parish hall was added, built by public subscription on the opposite side of Rowley Lane, but this was sold, as in the late 1980’s/early 1990’s it was felt the old hall was costly to maintain. Funds were raised for a new extension to the church (seen on the far left of the photo) which opened in 1992. The extension has a vicar’s vestry, a kitchen, an upper room, two toilets and the main hall. Entrance is via a wide ramped doorway, making the whole ground floor accessible to people with mobility difficulties. Chairs have replaced pews, a car park has been added and over the years the church has adapted and modernised in many ways. From 1st November 2018 a new benefice was created and St. John’s Church is now part of the Benefice of Lepton, Emley and Flockton with Denby Grange. What hasn’t changed is the message – it exists to meet the needs of our generation today.